Easter is one of my favorite holidays. Religiously, it’s a significant holiday and has great meaning for Christians. Beyond spiritual importance though, it carries a lot of hope and cheer to everyone. It comes at a happy time of year, as nature comes back to life after winter. And the colors (beautiful, soft pastels) and imagery (bunnies, eggs, and baskets) are visual mood-lifters. I like to play with this theme and “egg” my friends and neighbors to spread some extra cheer at this time of year. This year, I’ve decided to have some fun with the items I’m putting in the basket too. 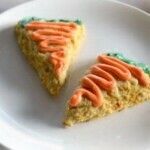 So, I baked up some carrot cake scones to include in them. I opted for scones because we usually deliver our baskets in the morning and these are a completely acceptable morning treat. If you’re planning an Easter brunch, these are the perfect addition to your menu. I don’t like my scones super dry and coarse, so these are a little softer and moister inside than a traditional scone. The upside to that is that unlike traditional scones, my kids LOVED these. The day I made these, they chose them for their after-dinner dessert over their other options of ice cream, cookies, or candy (leftover from Valentine’s Day)! One downside to making scones that aren’t hard as bricks, is that the dough can be sticky. When you roll these out to slice them into wedges, make sure you use a lot of flour to keep the dough from sticking to the surface, rolling pin, and your hands. Also, I find it easier to make clean cuts in the dough with a butter knife or a good pastry cutter instead of a sharp knife. 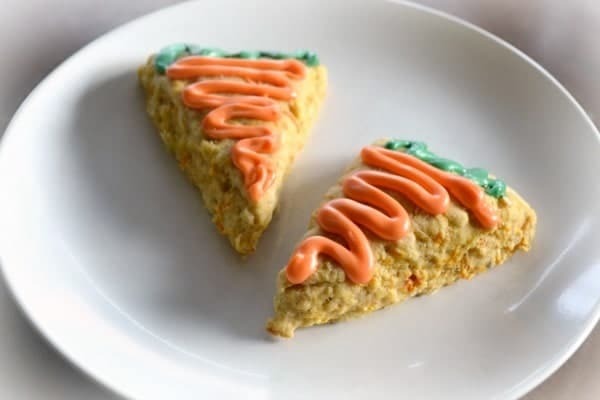 I was going for quick and easy, so I used Wilton candy melts to decorate the scones. I used a snack-sized plastic zipper bag as my piping bag (I just snipped off a corner to make a hole for the melted chocolate to come out). My teen daughter helped me – she did all of the green carrot tops. In a large bowl, combine all dry ingredients. Add the butter and using your hands, incorporate it into the dry ingredients until the mixture looks like large crumbs. Add the carrots and stir (or use hands) to mix well. Add the milk and gently incorporate it by using a rubber spatula to fold it into the dough. Working with half the dough, on a well-floured surface and with well-floured hands, gently press the dough into a circle. Use a rolling pin to enlarge and even out the circle it until the dough is about an inch thick. Cut the dough into 8 wedges using a butter knife, pizza cutter, or pastry cutter. Repeat the process with the other half of the dough. Place wedges on prepared baking sheet and bake at 350°F for 18-20 minutes or until golden brown. Remove from oven and allow to cool completely. While scones are cooling, melt orange wafers according to instructions on the packaging. 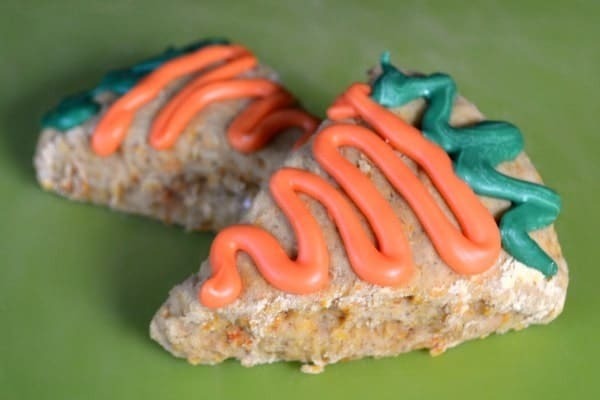 Using a piping bag (or plastic zipper bag with a corner cut off), drizzle the orange chocolate in a zigzag pattern on each scone to create the "carrot." Next, repeat the process with the green wafers to create the "carrot tops." Allow chocolate to set completely (5-10 minutes) before serving. You can make these healthier by substituting whole wheat flour for the all-purpose flour. The consistency of scones is ideal for making this swap since they are coarse and dense by nature. Most scone recipes call for heavy cream, but I use milk. For mine, I used skim (fat-free) milk and didn’t notice any negative effect on the taste or texture of the scone. You can also use mashed banana in place of the butter. I haven’t tried that yet so I can’t vouch for the end-product, but I would guess that you could also reduce or eliminate the brown sugar since bananas are so sweet. I don’t have a great healthy alternative for decorating the scones, so if you have any ideas, please let me know! I hope you enjoy these as much as my family did (and as much as I hope our Easter friends do). If you try them, please come back and let me know what you think. 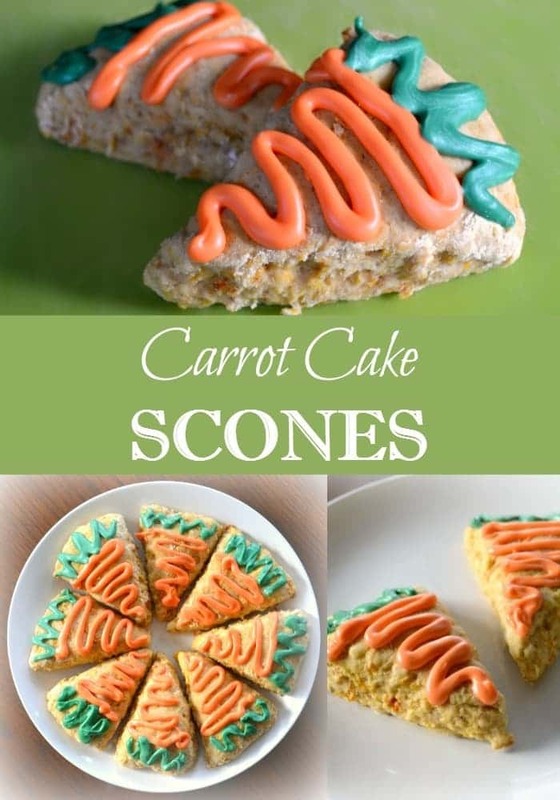 These look so fun and delicious….but I’m not seeing the actual recipe in your post. Maybe it’s just me or a gliche with my browser? It’s not you! Apparently I posted this during my brief period of trying a different recipe card. Should be fixed now! Oh good! Can’t wait to give them a try. Thanks! These are super cute and sound delicious! Thanks for sharing!